Find here some facts and profile information about Amar Singh Thapa, a great and bravery hero of Nepal. He is such hero of Nepal who fought solely for extending the territory of Nepal. We are very happy to post about some words about Amar Singh Thapa biography. He is one of the national Faces of Nepal. We don’t know the millions of words that we can write about Amar Singh Thapa biography but we just want one words for him, ‘Thank You’. Amar Singh Thapa is one of the great heroes of the country. While talking about Amar Singh Thapa Biography, Amar Singh Thapa is son of Umarau Bhim Singh Thapa. His father had got title Bhag Bhim Singh. He was born at Sirhanchok in Gorkha in 1761. He is a such a national hero of Nepal who spent all his active life fighting for his country Nepal. He never fought for having a desire for money or wealth and not for the any type of comfort or luxury. If we read the history of Nepal, we easily know that he fought solely for extending the territory of Nepal. Amar Singh Thapa has played very very important historical role in all the battles from the Gorkha side during the rule of Bahadur Shah, younger son of King Prithvi Narayan Shah. His father got death in the battle for Kathmandu valley. After his father’s death, Amar Singh Thapa received good guidance and fully care from king Prithvi Narayan Shah.For your kind information, Prithvi Nayaran Shah was the founder of Nepal. Amar Singh Thapa was put under military training at the young age of 8 years. He was brave and skillful in the art of war. It is because of his bravery that the border of Nepal had reached up to Sutlez and Gadwal. 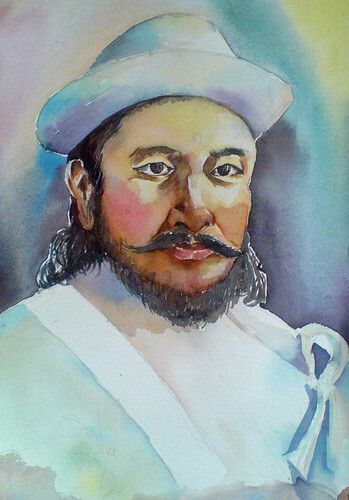 Amar Singh Thapa, who displayed an unprecedented valour in the western front during the unification wars, was even praised by the British in glowing terms During Anglo-Nepal War of 1814, Amar Singh Thapa sustained the Fort of Malaun for over six months with a meager 200 soldiers under him. Even in the most adverse situation, he never contemplated surrendering before the British. However, he had to eventually enter an agreement with the British when they took control of the Kumaun which he was assigned to protect. After the Treaty of Sugauli, the border of Nepal which had once expanded up to Tista and Sutlez , shrank to the present shape excluding Banke m Bardia, Kailali and Kanchanpur. Amar Singh Thapa could not bear the trauma of the defeat and instead of returning to the capital, proceeded towards Gosainkunda where he passed away On August 16, 1816. The bravery, self respect and heroism which he displayed before the British, has been inscribed in the Nepalese history in golden letters. He died in 1816, at the Gosainkunda. In short, Amar Singh Thapa was a great warrior of Nepal. He was the son of Bhim Singh Thapa and Umadevi Thapa. He was born in 1808 BS. He played an important role in conquering Sen kingdoms of eastern Nepal. He also conquered baise and chaubise states and extended the boundary of Nepal up to Tista river in the east and Kangada in the west. During the Anglo-Nepal war, he was the in-charge of Nepalese force. Can you please tell me Amar Singh Thapa’s mother’s name?? ?